The Opacity parameter is a parameter each drawing layer. It is set to 100% by default. By lowering it, you can make an individual layer appear more transparent. 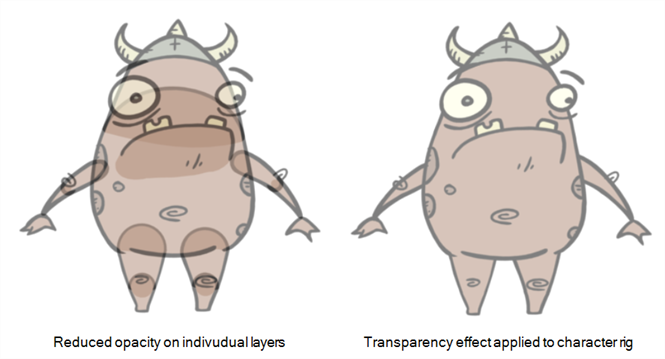 The Transparency effect is an effect layer that can be attached to individual layers or to a group. It has a Transparency parameter that is set to 50 by default. The higher it is, the more transparent the layer or group it is attached to will appear. It is important to know when to use either approach. For example, to make a character composed of several layers transparent, it is preferable to put the character's layers in a group and add a Transparency effect to the group, as reducing the opacity of individual layers will make their overlapping parts visible—see About Groups. If you need to animate the transparency of elements in your scene, it is possible to animate the opacity of individual layers by creating a function for the layer's opacity parameter, which you can do from the Advanced tab of the Layer Properties view. However, this may be impractical as a layer's opacity parameter cannot be animated in the Timeline view. You can only animate it by opening the Function Editor from the Layer Properties—see Creating Functions. You can however animate a Transparency effect's parameter in the Timeline view, so this may be a preferable approach even if you only want to animate the transparency for a single layer. To learn how to add and animate an effect, see Adding Effects Layers and Animating an Effect.